Like an immense brain, the city directs our daily lives. Information, people, commodities – they move like stimuli and signals along the neural pathways of the streets to the nodes of storage and exchange. The city is the overarching structure that guides and accompanies our comings and goings. This is true in general of all cities and urban agglomerations, but each city, metropolis or megalopolis is different in its specific accumulation of zones, districts, possibilities, events, contacts and failures. Every urban district is different through the way in which life is made possible or impossible there. The way in which the city is experienced eludes the attempts to give it an unambiguous image or logo. Every effort at city branding eventually runs aground on the use that the city itself imposes. It is precisely this aspect of the city that is given a voice in a number of works by Giny Vos. It happens very literally in her first large work for the public domain. The words ‘work to do’ that appeared on three high-rise office blocks in the Marconiplein in Rotterdam on the night of 21 to 22 December 1985 transmitted the frank message that this city conveys to its residents. The people of Rotterdam have for a long time had a reputation for being hard workers, but this image of the city had never been made so directly visible before. More important than the credo of her native city that Vos shows here, however, is the statement that she makes with it about the role of art in the public domain. The question of who speaks and who is addressed plays a role in the background to every debate on works of art in public space. Do the artists bring their images out into the open in the hope of reaching a public, or is it the patrons who use the work of art to give vent to their ideas about cultural education, local identity, social cohesion or gentrification? Or, in an attempt to reverse or to disguise the one-way traffic, is it the voice of the residents themselves that is heard this time? The city speaks through Vos – the city not as an administration or organisation, nor as a residents’ association or project developer, but as the intersection of built environment and everyday use. This is the city as practice, as event, historically determined and orientated towards the future, imperfect and unexpected. The voice of the city is raised in another work from twenty years later. Lokroep/The Painted Chat (2006) shows even more clearly how the urban dimension makes itself known. When night falls, big words appear on the Westpoort municipal depot almost on the outskirts of the city. The words are taken from the jargon of the park attendants, road menders and salt spreaders who are based there, but these references to the practice that is concealed in the building alternate with words that seem to allude to a much more fairy tale reality. A strange, poetic voice sings its texts in the night, words that are an expression of the surroundings as they are actually experienced there, but that also refer to everything that may have taken place or might ever take place there. It is the city that announces its existence here and at the same time fantasises about the future and about everything it has to offer to this marginal terrain. But if you keep on looking, you see that the words do not form a sentence, they react exclusively to one another. The building makes associations with the sounds it produces, it allows itself to be led from one untranslatable word to the next (‘mistroost’, ‘moerstaaf’, ‘mode moer’, ‘Iamoer’), from down-to-earth to enchanting and from descriptive to impossible. Here the city seems to be talking to itself, dreaming. 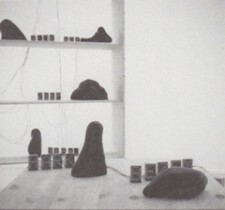 In 1997 Vos made an installation entitled The Things That Dreams Are Made Of. A wooden cupboard housed solidified shadows, dark figures without clear form or meaning, separated by individual blocks of LED lights on which words appeared – constantly changing, as though someone is desperately attempting to give the indeterminate figures a name. It is a work that aptly conveys the dream process: the sometimes sinister character of the shadows in our heads and the dream activity that tries to arrange and exorcise them. With this explicit dream and the impossibility of grasping it, Vos offers insight into a theme that also plays a major part in her work for the public domain. This can be seen clearly in Second Thought, that she made in Groningen in 2008. An inverted transparent dome hangs from the ceiling of a bike shed and reflects, upside down, the contours of a building in lines of light. The building glows and fades, and then a bat-like shadow suddenly seems to be hanging threateningly over the building. Because from time to time the snow dome is dotted with cheery flurries of flakes of light, the first reading of the work is light-hearted. It is only on closer inspection that it reveals its more dreamy and sinister aspect. The building encapsulated in the snow dome is the nineteenth-century station that is partly hidden from sight by the new bike shed and that in its restored state has lost much of its previous function. Perhaps the prospect of a future as a snow dome is the greatest desire and at the same time the greatest fear of every building. And that seems to be the fate of the old station too. But the building also dreams of the shadow that it once cast over the city and about the power that it may perhaps have again in the future. What is a personal dream of the artist in The Things That Dreams Are Made Of proves here to be a dream that is dreamt at the level of the city. And in retrospective, that is a characteristic of all of Vos’ earlier works in the public domain. Work to Do is less of an exhortation than an uneasy thought that the city dreamily mumbles to itself, like the building in Westpoort that talks in its sleep. These dreams, like ours, always have a bright and a dark side, as can also be seen in the work that can be regarded as Vos’ ultimate dream: Castle for Mike (1997). This work has a hallucinatory character, but was never more than a dream as it turned out to be impossible. All the same, it shows how Vos gets to the very bottom of a city. New York has here become not only a city of lights that outshines Paris, but also a city that dreams about a heroic past it has never known and whose nightmares about a closed fortress were to become reality a few years later. The ambiguous character of the dream is the characteristic of the work of Giny Vos. It is accommodating and aloof, accessible and unfathomable. That is why it fits perfectly into the urban space, or rather, into the urban dynamics that is always marked by the paradox of proximity and anonymity. It is a paradox that you cannot pinpoint generally, but that presents itself in a different guise on every differentiated spot in the urban environment. 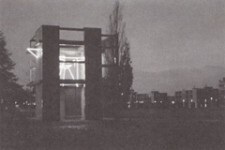 For instance, The Illuminated Room (2007) shows the ambiguous character of the Limos site in Nijmegen. This former barracks has been opened up by the Nijmegen local authority for housing and, as is usually the case in urban renewal in the Netherlands in the last few years, has been filled mainly by urban villas in a secure, park-like setting. The Illuminated Room consists of a remnant of the officers’ quarters that was later used for student accommodation. This remnant is a block of two storeys in which, when it is dark, a simple interior with a table and a chair is illuminated. What was formerly a closed barracks seems to have become less forbidding, exterior and interior blend in this typically Dutch view of an interior at night when the curtains are never drawn. Closer inspection, however, reveals that the out of plumb interior is actually cold and uninviting, the building itself is open on all sides and offers no shelter. The Illuminated Room is as hospitable as the residents, for whom the installation of a work of art aroused fears that it would become a meeting place for juvenile delinquents. Time and again the seemingly friendly works of Vos turn out to contain a sting in the tail. Miracle in between, made in 2009 for an exhibition in the public domain in Delhi, shows another dream image: a boat of light floats in a forest of bamboo stakes. It presents a situation of transition, of in between, in every respect: it is situated on Ramlila Ground, a strip between old and new Delhi, and combines a traditional building material with the latest technology. In that sense it shares the Indian optimism about a transition to a brighter future. But the boat is also trapped in the bamboo grid, thereby raising the question of the confinement of the city in innumerable gated communities. Their ambivalent character makes it difficult to place works like these. They offer a view of hidden aspects of the city, but the role that they play for the public domain is not immediately clear. To understand it better, we should take a closer look at how these dream images are put together and what effect they have on the context in which they find themselves. In 2008 a new station forecourt was created in Apeldoorn that is dominated by a 100-metre long glass wall for which Vos made Travelling Sand. By means of more than a million LED lights placed behind a wall of etched glass, she creates a continually changing and shifting sand landscape, desert images in the heart of the city. This work too is reminiscent of a dream: Apeldoorn reflects on its past, dug up from the surrounding sandy wilderness of the Veluwe, but perhaps the city is also nostalgic for the time when it had no metropolitan ambitions, or fears the moment when it will be buried by the sand again. At any rate, a calming image confers character, without defining its meaning, on precisely that spot that is full of life and where the metropolitan dynamism is expressed in the flows of travellers and cyclists that interweave and bump into one another. This reluctance to impose meaning is typical of the way in which Vos’ work allows the city to speak with its own voice. In each case her work of art does not add any extra information, does not make any explicit statement, and clothes the urban complexity and ambiguity in a clarity that conceals nothing. And although the work is often part of drastic interventions in the urban fabric, it resists the attempts to design public space. With its dreamy character, it puts up an opposition to the interventions that are intended to give the indeterminate areas of the city a clear function by means of a design aimed at specific target groups. Vos allows the public domain to become the space that the city leaves open again, a space whose significance cannot be reduced to a clearly defined use, but where the production of meaning is possible because its use has not been pinned down. The city dreams. And every attempt to wake it up is doomed to failure. No matter how precise the urban planners’ interventions may be, nor how cleverly the politics of the space tries to iron out the folds, the complexity of the city ensures that there will always be new wrinkles and obstacles. The city shows its true face especially at night. That is when the alleys, streets and squares are filled with longing and unfulfilled desires, when fear creeps along the walls, when the city is content with all its cares. And in the dark the works of Giny Vos light up. Published in: Giny Vos, Singing in the Dark, 2010, Valiz, Amsterdam. What Kind of City Centre Will the Zuidas Become?